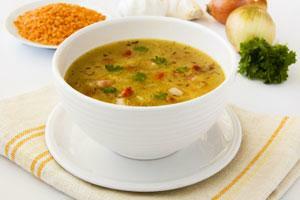 Are you looking for low fat soup recipes? You'll be pleasantly surprised to learn it isn't hard to make tasty homemade soup that is low in fat. Many traditional soup recipes can be converted to lower fat versions by simply substituting a few ingredients. For example, instead of using heavy cream in chowder, evaporated skim milk can be used. Likewise, since vegetables and beans are low fat ingredients, adding a good amount to any soup will bulk up the recipe without adding fat. Here are a few lightened versions of popular soup recipes. The recipes below can be served alone or in smaller amounts as a side dish. Make chicken and corn chowder by adding one cup of cooked chicken to the recipe when adding the milk and flour mixture. When you learn how to make these simple and delicious low fat soup recipes, you won't have to blow your diet to enjoy hot, nourishing soup for lunch or dinner, any day of the week.